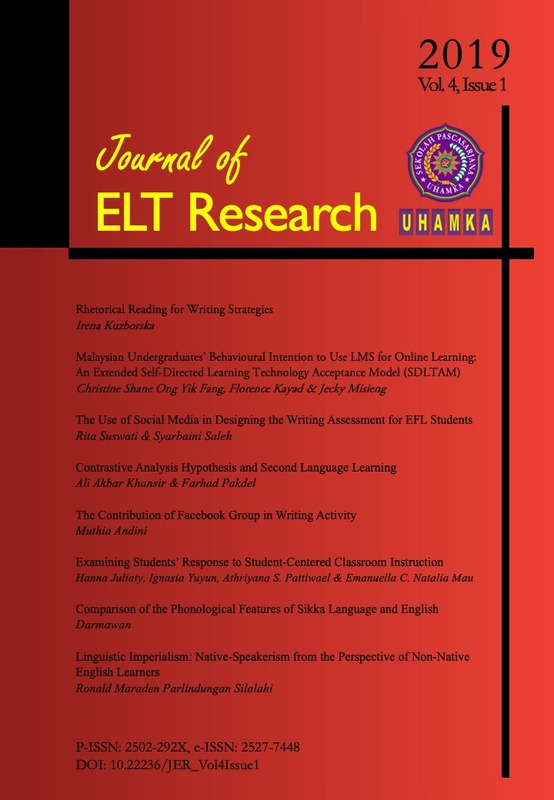 Journal of ELT Research (JER) is a peer-reviewed academic journal of studies in English language teaching and learning published biannually in January and July. Given that the journal prioritizes research reports in ELT, viewpoint articles in the same field will be considered for publication. Journal ISSN: 2502-292X, e-ISSN 2527-7448. The scope includes the teaching and learning of English as a foreign or second language: teaching strategies, language curriculum, testing and assessment, linguistics and teaching, literature and teaching, ICT in language teaching, etc. The Articles submitted should follow the Author Guidelines. Your articles should be sent as MS Word documents to jer@uhamka.ac.id or through journal online submission webpage. Publication Fee: Our journal does not charge any fee for submission, reviews and publication (free of charge). Editorial office: English Education Program, Graduate Schoool, University of Muhammadiyah Prof. DR. HAMKA. Address: JL Warung Buncit Raya, No. 17, Jakarta Selatan, DKI Jakarta, Indonesia Post Code 12540. Tel +62 21 7918 4063. Email: jer@uhamka.ac.id. Journal of ELT Research is licensed under a Creative Commons Attribution-ShareAlike 4.0 International License.